Natural selection has turned out some animals with amazing abilities. Molluscs with hard-as-steel magnetic teeth . . . shrimp that can momentarily generate temperatures approaching the surface temperature of the sun . . . jellyfish that are functionally immortal . . . and let's not forget humans, whose ability to read and write YouTube comments is unprecedented in our planet's history. But not every animal is blessed with superpowers that will someday earn them a place on a Cracked.com list. Sometimes evolution makes you a prince, and sometimes it makes you the prince's whipping boy. And flailing near the top of evolution's underdog pile may well be Pontomyia, the flightless marine midge. 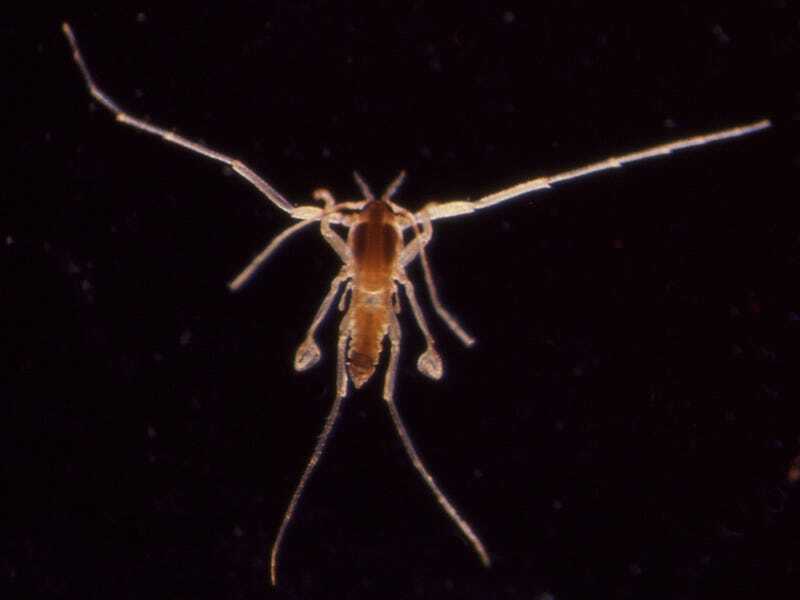 Pontomyia is the closest thing to a fully marine insect, spending all but a couple hours of its life under the sea, in coastal locales ranging from Japan to Australia. Its early life isn't too remarkable: hatch from an egg, float around as a larva eating algae, harden into a pupa (during which, like all pupating insects, you basically melt down your entire body into goo), finally emerging as a mature adult ready to perpetuate your species. It's as an adult, however, that you realize what a terrible hand you've been dealt. If you're a male, you have at most three hours to live. You're a fly, but your wings are so deformed that you can only stand on the water's surface (or you'll drown). You have no mouth, either, so your body is definitely planning on your quick expiration. Tetrapods that returned to the sea got to be totally awesome: whales, dolphins, sea turtles, sea snakes, plesiosaurs, icthyosaurs, mosasaurs, etc. Apparently the one time insects tried the same thing, they found the sea had spent the last 450 million years singing "I will survive" and was not about to let them just walk right in. Because the sea was saving all its loving for someone who loved the sea.